This archaeological site is known as the Lonoikamakahiki Residence. It is believed that during different periods of time, four great Hawaiian kings lived at this site. These kings were Umi, Lonoikamakahiki, Kalaniopuu, and Kamehameha I. This residence is believed to have been originally built by Umi. Umi was the son of Liloa who was a superior chief of the entire island of Hawaii who lived in the 15th century. Liloa and Umi were direct descendants of Pili, a high chief brought to Hawaii from Tahiti in the 13th century to restore the Hawaiian Alii blood lines. Umi is believed to have lived here after restoring the kingdom under his direct rule upon the death of his father Liloa and that of his older brother Hakau. Lonoikamakahiki was the grandson of Umi. Upon the death of his father Keawe-nui-a-umi the island lands were divided up and the Ka'u and Puna districts were given to Lonoikamakahiki. Later through marriage and victories over other district chiefs, Lonoikamakahiki became the ruler of the entire island of Hawaii. unification of the entire island under his control, Lonoikamakahiki and his wife Kaikilani made a trip to Maui where they were hosted by the Maui king Kamalalawalu. Soon after Lonoikamakahiki returned to Hawaii, Kamalalawalu amassed a large fleet and invaded Hawaii. Lonoikamakahiki's older brother Kana-loa-kua'ana with a smaller force met the Maui invaders and were defeated. In an ensuing battle Lonoikamakahiki defeated the Maui King Kamalalawalu and his invading army. A legend exists that Kamalalawalu was captured and taken to the Ke'eku Heiau (behind the former Kona Lagoon Hotel) where he was impaled and kept alive for 10 or 11 days. After this period he was slain and his body was towed out to sea for the niuhi (man eating sharks). What was left of his bones were put with the bones of his two dogs that came to Hawaii with the Maui chief and these bones were sent back to Maui. After Lonoikamakahiki's unification of the entire island of Hawaii under his control and his destruction of the Maui invaders, Lonoikamakahiki lived the rest of his years in peace in Kahaluu. The most probable location was at the Lonoikamakahiki Residence. It is believed that after the sacrifice of Kamalalawalu at the Ke'eku Heiau, Lonoikamakahiki established it as a Pu'uhonua (place of refuge). Later Kamehameha I dedicated the Ke'eku Heiau as a luakini heiau for the sacrifice of human beings to his bloodthirsty gods. After Captain Cook was slain at Kealakekua during his unsuccessful attempt to take King Kalaniopuu hostage for the return of a stolen longboat, Kalaniopuu moved to Keauhou where he could surf in the waves of Kahaluu. Kalaniopuu was obsessed with the hula and summoned young and old, including infants barely able to walk, to hula for him. Because of its large Kahua (an area for games, entertainment and meetings), the Lonoikamakahiki Residence was an ideal location for these performances. The Lonoikamakahiki Residence is the most likely place that King Kalaniopuu and his court resided in those days. The hula performances would have been conducted in the area where the tennis courts exist today. King Kamehameha lived for one year in Kahaluu after moving his capital from Oahu to the Big Island in 1812. It is believed that because of its size and location that the Lonoikamakahiki Residence was the place where he lived during that period. Although it is not known for certain that Umi, Lonoikamakahiki, Kalaniopuu or Kamehameha I lived at the Lonoikamakahiki Residence, it is known that each lived for a time at Kahaluu. 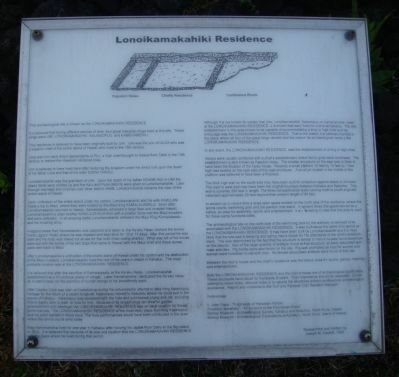 The only establishment in this area known to be capable of accommodating a king or high chief and his entourage was the Lonoikamakahiki Residence. This is the reason it is believed that this is the place where all four of the great kings resided and the reason its archaeological name is the Lonoikamakahiki Residence. In any event, the Lonoikamakahiki Residence was the establishment of a king or high chief. Heiaus were usually combined with a chief's establishment where family gods were worshiped. This establishment is also known as Kapukini heiau. The smaller enclosure on the east side is likely to have been the location of the heiau house. Recently a small platform 18 feet by 15 feet by 1 foot high had existed on the east side of this east enclosure. A amall pit located in the middle of this platform is believed to have been a fireplace. The thick high wall on the south side may have been built for protection against attack or intrusion. This east to west wall may have been the original boundary between Kahaluu and Keauhou. This wall is currently 250 feet in length. The three compartmental walls running north to south originally extended approximately 50 feet beyond their present length of 65 feet. In ancient up to recent time a large open space existed on the north side of the residence, where the tennis courts, swimming pool and the pavilion now stand. In ancient times this space served as a kahau, an area for assembly, sports and entertainment. It is interesting to note that this area is used for these same functions today. The archaeological site on the north side of the swimming pool [see the nearby Hale Mua marker] by the walkway is believed to be associated with the Lonoikamakahiki Residence. It was built about the same time period as the Lonoikamakahiki Residence. It may have been built by Lonoikamakahiki and it is most likely that the site was a sleeping and eating men's house for the attendants of the chief's establishment. This was determined by the fact that the structure is similar to men's houses found elsewhere on the islands. Also of the large quantity of artifacts found at that structure, all were associated with male activities. Pig bones were also found on the site. Pig was prohibited as food for women and women were forbidden to eat with men. No female-associated artifacts were found at that site. 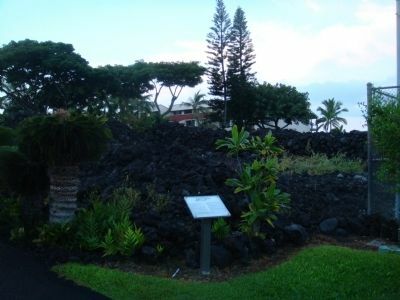 Between the men's house and the chief's residence was the kahua (area for sports, games, meetings and entertainment). Both the Lonoikamakahiki Residence and the men's house are of archaeological significance. These structures have stood for hundreds of years. Their importance should be respected. Do not attempt to move rocks, remove rocks or to rebuild the structures without professional archaeological assistance. Report any violations to the Surf and Racquet Club Resident Manager. Ii, John Papa - "Fragments of Hawaiian History"
Forander, Abraham - "An Account of the Polynesian Race"
Location. 19° 34.37′ N, 155° 58.012′ W. Marker is in Keauhou, Hawaii, in Hawaii County. Marker can be reached from Alii Drive half a mile north of Kamehameha III Road, on the left when traveling north. Touch for map. The marker is on the grounds of the Keauhou Kona Surf and Racquet Club, which is a gated community. The Club must allow public shoreline access and, therefore, the marker is presumably accessible to the public. Park on the road near the gate. The marker is just inside the gate at the southeast corner of the tennis courts. Marker is at or near this postal address: 78-6800 Alii Drive, Keauhou HI 96739, United States of America. Touch for directions. Other nearby markers. At least 8 other markers are within walking distance of this marker. Hale Mua (within shouting distance of this marker); Inikiwai Ku'ula Heiau (about 700 feet away, measured in a direct line); Keauhou - Kahalu'u Heritage Corridor (approx. 0.4 miles away); Kuemanu Heiau (approx. 0.6 miles away); Kauikeaouli, Kamehameha III (approx. 0.8 miles away); Keauhou Bay (approx. 0.8 miles away); Birthplace of Kauikeaouli (approx. 0.8 miles away); Kauikeaouli and Nāhi'ena'ena (approx. 0.9 miles away). Touch for a list and map of all markers in Keauhou. More. Search the internet for Lonoikamakahiki Residence. Credits. This page was last revised on June 16, 2016. This page originally submitted on January 2, 2011, by William J. Toman of Green Lake, Wisconsin. This page has been viewed 1,520 times since then and 18 times this year. Photos: 1, 2. submitted on January 2, 2011, by William J. Toman of Green Lake, Wisconsin. • Syd Whittle was the editor who published this page.